Vimeo is a popular video sharing site that has built its large worldwide audience by offering artist large control over their video content, and having great relationship with its community. If you are tired of the worst elements of YouTube (overcrowded video pages that are not suited for film makers and artists), then Vimeo is a perfect place for you. It offers great community features, total control over your uploaded content, precise sharing options, and support for high video quality that attracts film makers and artists from all around the world. If you have been active on the internet in the last decade, you may have witnessed the rise of many popular social web services – from social networks, web 2.0 apps, expansion of cloud powered apps and off course, video sharing apps where YouTube manages to reign supreme. However, one of its closest competitor over all of its years of service was Vimeo, innovative video service that has attracted more professional crowd of uploaders and viewers, mostly centered around film industry, indie productions, film students and documentary creators. Vimeo was formed in late 2004 by Jake Lodwick and Zach Klein who left the firm few years later. 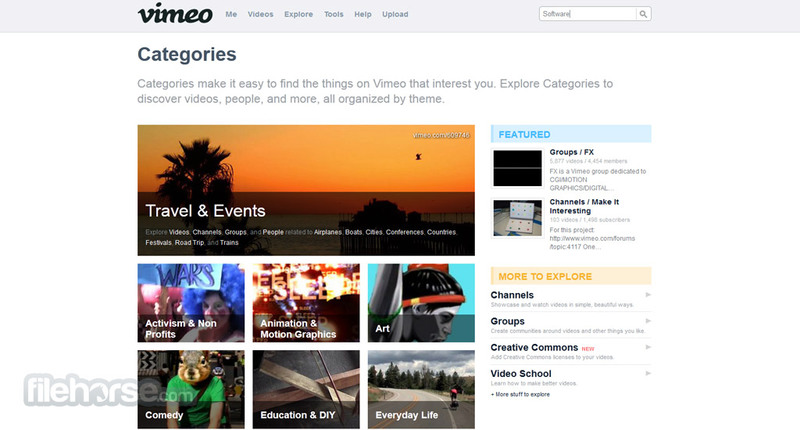 In 2006 Vimeo became a part of IAC/InterActiveCorp. In 2007, Vimeo revolutionized the internet video sharing by being the first streaming service that supported commercial sharing of 720p HD videos, which immediately attracted professional users and filmmakers. Year after that, Vimeo unveiled its premium subscription service Vimeo Plus that game more robust options and support to professional users who wanted more weekly uploads and better control over their channel, better video encoding, community management, and more. As of 2010, Vimeo fully supports high quality encode of 1080p videos and unlimited HD embeds on other internet sites. Vimeo is one of the most popular video-sharing websites in the world which enables users to freely view, upload and share videos. Since 2004 when this site was first launched until today when it attracts more than 100 million users each month, this website became known for its attention to high quality videos and very professional presentation that is not present with its competitors. One the main reasons why this approach to clean presentation and HQ videos brought Vimeo popularity are independent filmmakers, who brought large amount of new users to the site, either as the visitors or as community members who chose to stay on Vimeo and engage in text and video communication. Today, with more than 22 registered members, Vimeo accounts to very significant 0.11% of bandwidth of the entire internet. As many other video uploading and sharing services, Vimeo offer its users easy and streamlined way to manage their video collection and incoming video subscription feeds. 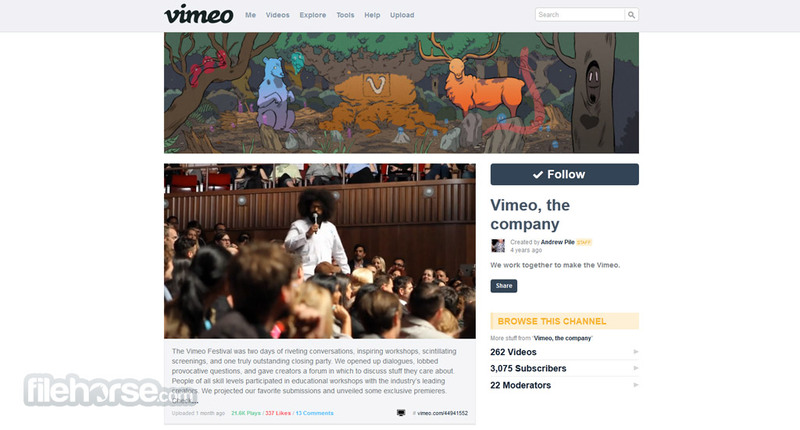 After making an account your Vimeomain page will feature subscription feed, access to your playlists, Activity of people you follow, Stats, Upload tools and easy way to explore everything Vimeo has to offer (via Categories, Channel search, Groups, Staff Picks and more). Even if you don’t appreciate high quality videos that Vimeo hosts and you visit it just for its content, you will surely appreciate its 100% free service. Vimeo has very minimalistic and no-nonsense design that promotes quality and meaningful discussion. We really can’t find any faults with it, site is pleasing to the eye, fast, navigation options placed well, and content can be easily discovered. 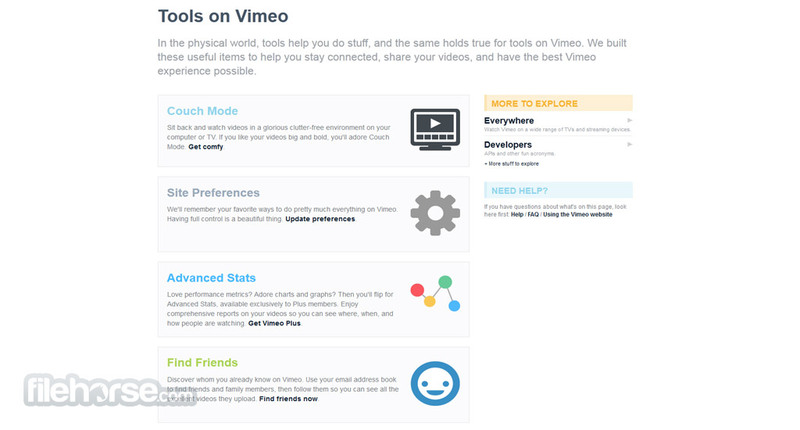 Basic functions of Vimeo are free, enabling everyone to watch videos, upload new content and share it both with Vimeo and external communities (integrated promotion buttons, video player embedding into external sites). 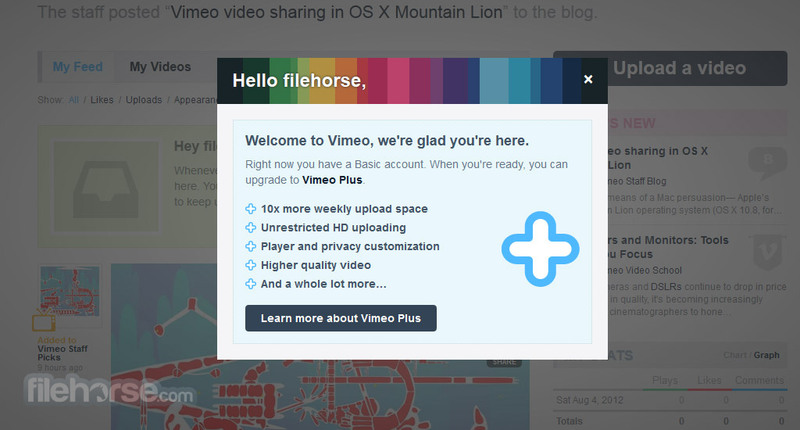 Vimeo Plus gives more options to professional users, costing only $9.95 per month. If you are really serious about making Vimeo home of your video production, for $199/year you can get Vimeo Pro. Vimeo is a great video sharing website that will most surely enable you to find incredible amount of high quality content from any theme or category you are interested in. If you are a filmmaker or a home video producer, you have to check out its service right now. Putting your videos on Vimeo is ridiculously simple, even if you hate technology. Let the world watch your videos, or share them privately. It’s totally your call. Your senses will be dazzled, your heartstrings plucked at, and your life changed forever. Vimeo works brilliantly on smartphones, TVs, and other futuristic devices. Learn how to make better videos from fun lessons in Vimeo Video School. Get music for your videos, create your own Channels and Groups, and more.